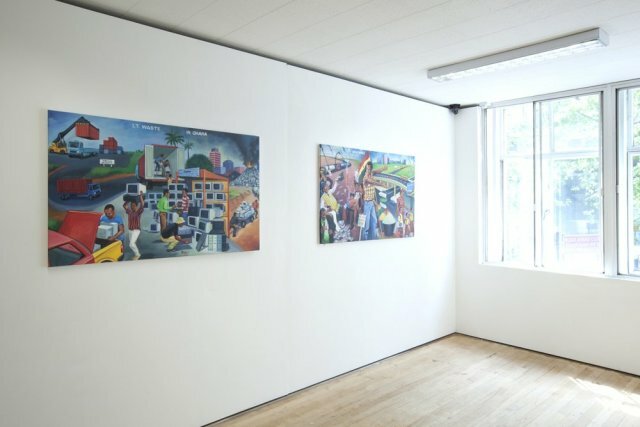 Jack Bell Gallery is pleased to present a group exhibition of painting by three Ghanaian artists living and working in Kumasi. Kumasi, capital of the Asante region and Ghana's second largest city, is known throughout West Africa as a cultural city. Visual communication is an integral part of Ghana's urban landscape and Kumasi is renowned for its thriving scene of street painting workshops, with their masters, assistants and apprentices. It was artists of this kind that achieved international notoriety in the 1989 Pompidou exhibition, Magiciens de la Terre. 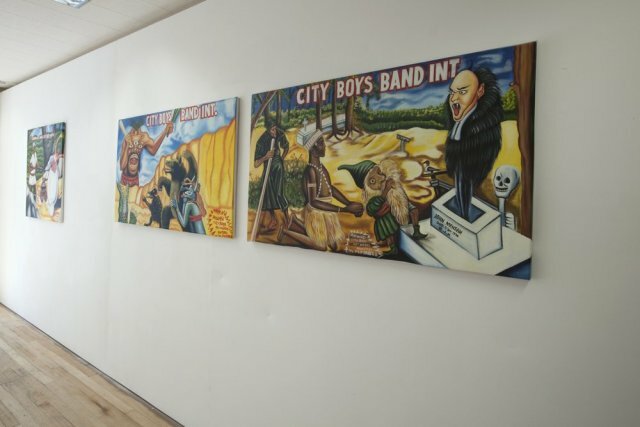 From the highly informal workplace of the street, the three artists exhibited display a vitality that recalls Basquiat and Haring's downtown New York of the 1980s. Almighty God's paintings are elaborate, realistic and satirical images of fantasy intermingled with textual excerpts. One cannot help thinking of urban graffiti as Almighty's letters abruptly change course and abandon all sense of alignment. 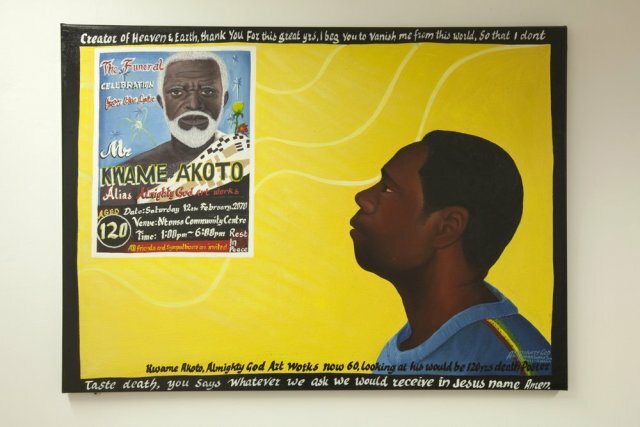 His art is profoundly religious and the subjects it tackles undoubtedly strike a chord with those who, like the artist himself, have connections with the Churches whose numerous congregations can be found all over Ghana. 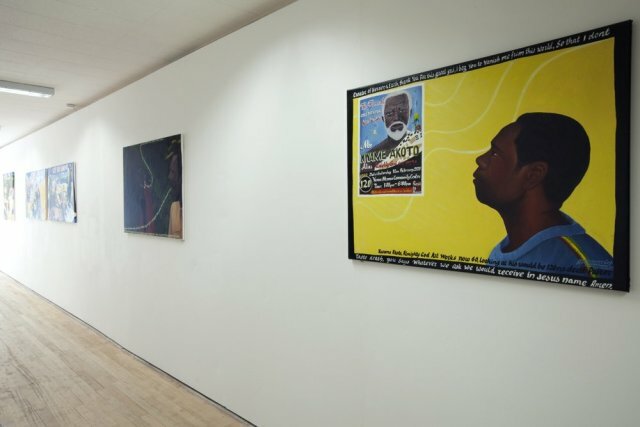 Whether referencing Christianity or images associated with the realms of 'juju' and witchcraft, Almighty consciously uses his art as a genuine evangelical tool. 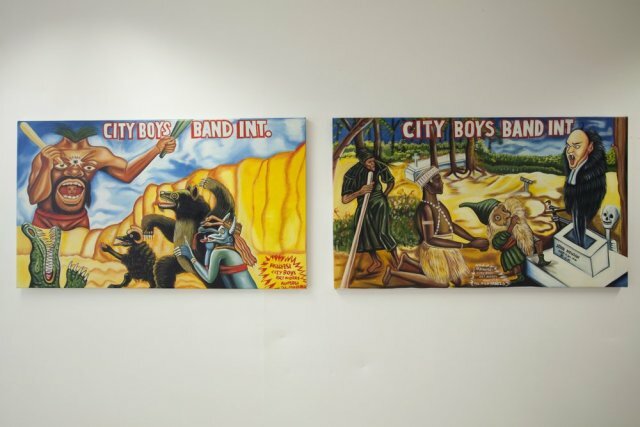 His work is held in the Pigozzi Collection of Contemporary African Art and has been included in major museum exhibitions at the Dapper, Paris and The Center for African Art, New York. Akwesi Addai paints voracious animals, hooded executioners and long-tongued witches alongside film imagery from Kung Fu, Dracula and Splash. His vivid compositions are drawn from huge theatre and cinema advertisements found on Kumasi's main streets. Like film trailers, the paintings fuse events from everyday life, mythical and biblical tales, and violent and disturbing fantasies. 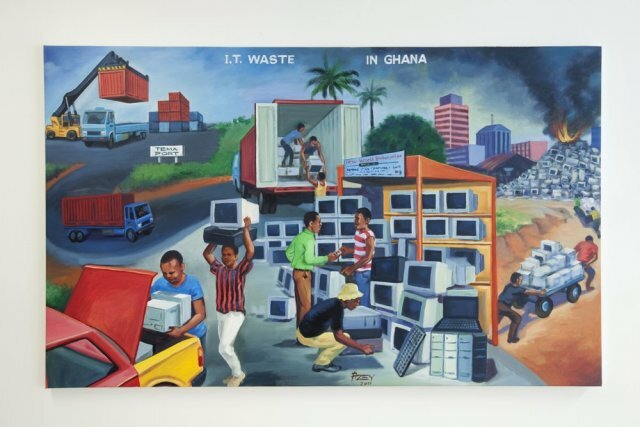 Acknowledged locally and abroad as Kumasi's most accomplished artist in this field, Addai's works have become highly collectable with the onset of low-cost digital media. 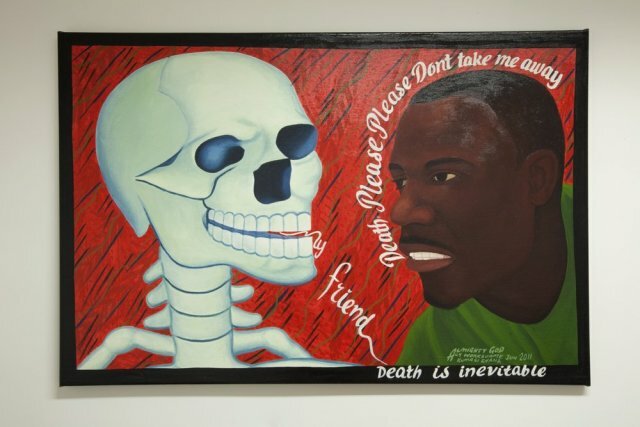 The paintings of Isaac Otchere Azey address issues of morality, sexuality, illness, social inequality and corruption. Azey quickly developed a reputation throughout Kumasi both as a local commentator and master of popular painting. He works with a rich palette to dramatise his subjects and engage the viewer. While he has shown widely in Ghana, Europe and the USA, this will be his first exhibition in London.